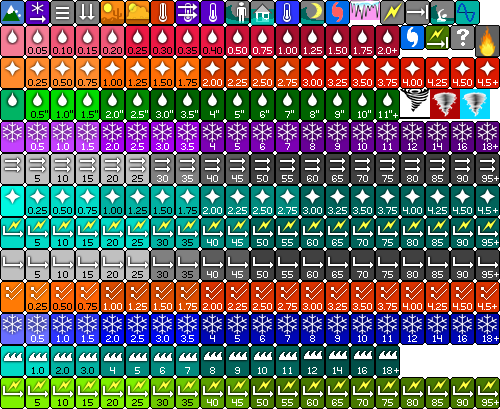 In this example, we use a spritesheet to contain many, many icons that are used in hotspots, here depicting Local Storm Reports (which are dynamically generated, and use the fof_extention= parameter within the file_of_filenames). Click here to see the 'spritesheet' image. The LSR display has been linked to overlay #1 ("LSR") and we use the 2nd overlay to display watches and warnings. Note that overlay #1 is an image that just contains some text showing that it is visible and to illustrate that the "hotspot" icons are displayed on top of the image. We continue to use the "tooltip" of the hotspots and hotzones to display abreviated information, with details being shown when the user clicks on the spot or zone. The icon images in the spritesheet are Copyright© 2016 by StormQuest Technologies, and is used here by permission.